A niche card that has some uses in yog, just not that much now that all the cards with good synergy have been restricted. Not worth the cost if it isn't night. If it is night, the arcane icons only really help if your character wasn't ready before he went to stories, since it readies the card anyway. Under those circumstances however, getting a surprise character to defend a story the opponent wasn't expecting could be game changing - if said character has terror or combat it can change the maths a lot. Adding 3 arcane means you are going to often have an opponents character knelt as a consequence. For a 0 cost event. 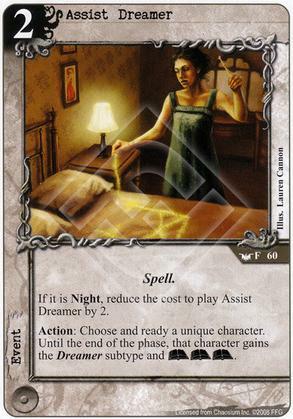 And I haven't even went into potential dreamer synergy, plus being a spell Yog has some applications. I'd seriously consider its inclusion in a night deck. At 2, this card is pretty awful. At 0, it gets niche-playable. Being able to ready a defender when you don't have any domains up is great, but maybe not worth the card. So, if I can make it night reliably, this gets a lot more appealing.